As Canadians, we take pride in our starry skies, northern lights, and large stretches of wilderness. And yet, more and more, we are urban dwellers, filling our skies with artificial light that blocks out the moon and the constellations. Stargazers and nature lovers have begun banding together to create Dark Sky Preserves, sanctuaries from artificial light where people can enjoy the splendour of the night sky. Cypress Hills Interprovincial Park was designated as a Dark Sky Preserve in 2004, and park employees are working hard to provide a wide variety of opportunities for people to experience the park in both daylight and starlight. Melody Nagel-Hisey is a Park Area Naturalist for Cypress Hills Interprovincial Park, where she has worked since 1993. She says that the public stargazing programs have been a popular park program for many years, but they are sure to become even more popular now that the park has an observatory, an astronomer in residence, and a Dark Sky Campground. The Friends of Cypress Hills Park first discussed building an observatory in 2007. With only a little government assistance, the Friends began constructing a 16-foot stand-alone observatory and a yurt classroom in fall 2010. A local carpenter was hired during start-up, but the volunteers did much of the work themselves. The Friends of Cypress Hills Park have also donated several telescopes. 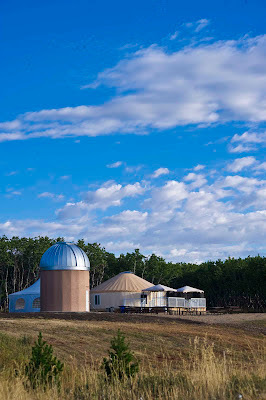 The smaller 10” and 12” telescopes are set up outside, while a 14” Celestron telescope is set up in the observatory and connected to the yurt classroom. There is room for about 10 people in the observatory where they can take turns viewing the night sky. Larger groups use the classroom. Images from the observatory telescope can be projected onto the screen, and a laser beam can be used to point out different constellations so that people know exactly what they are looking at. In the daytime, visitors can use the solar telescope to view the sun without hurting their eyes. 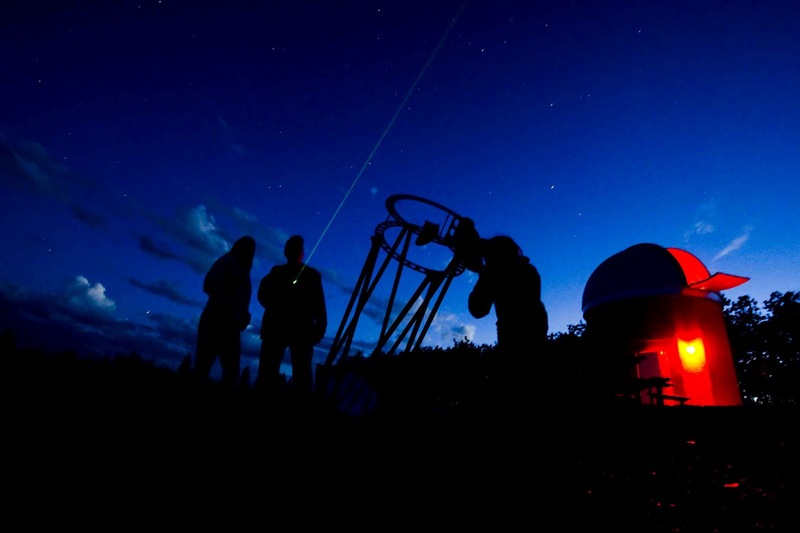 Starting in 2012, a University of Regina astronomy student will be volunteering for the summer. The student will be located at the observatory and available, along with park interpretive staff and visiting astronomers, to provide public programs. Stargazing groups meet at the observatory at dusk when there is still enough light to get organized and take a quick look at the star locator maps and other handouts. 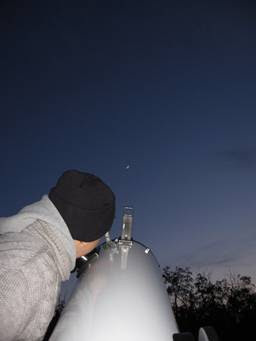 Visitors take turns using the telescopes, which have been set up to focus on a particular star or constellation. Tour guides provide background information and discuss how First Nations people used to navigate by the stars when they were travelling and had their own set of names and myths surrounding the different constellations. The Regina and Saskatoon chapters of the Royal Astronomical Society of Canada work closely with Cypress Hills Park, providing expertise and information. They hold an annual Summer Star Party, which includes a full program of activities, with both convention and public programming. Light and dark trigger changes in the human anatomy. When we disrupt our biological clock, we experience problems, such as jet lag or increased illness due to shift work. And yet, it is rarely fully dark. The park is switching over to flat-lens street lights that direct the light down and not up in the Centre Block. In addition, business operators and cabin owners are being encouraged to install dark-sky compliant lighting and to turn indoor lights off when they are not in use. The Alberta side of the park recently distributed special light bulbs to all their patrons to encourage them to install dark-sky compliant lighting at their cottages. Melody hopes that the Saskatchewan park can find a partner in order to provide a similar program. Explore the information on the SkyNews website.